This past weekend was all about comfort. I don't know about you, but dark, stormy weather typically equates to me wearing dark clothing. Remember how I mentioned that I took advantage of the Shopbop Thanksgiving sale? Well, I finally caved and purchased these Rag & Bone booties. In addition to pretty much being the perfect black ankle bootie, they're THE most comfortable shoes I own and I couldn't be happier with them. I love your boots, so stylish! LOVE the booties, they look perfect with the outfit! So glad you also got a rainy day this past weekend as well! LOVE this outfit from head to toe, Audrey! You look like you'd fit in on the streets of London perfectly! ;) Love those boots and your sweater! 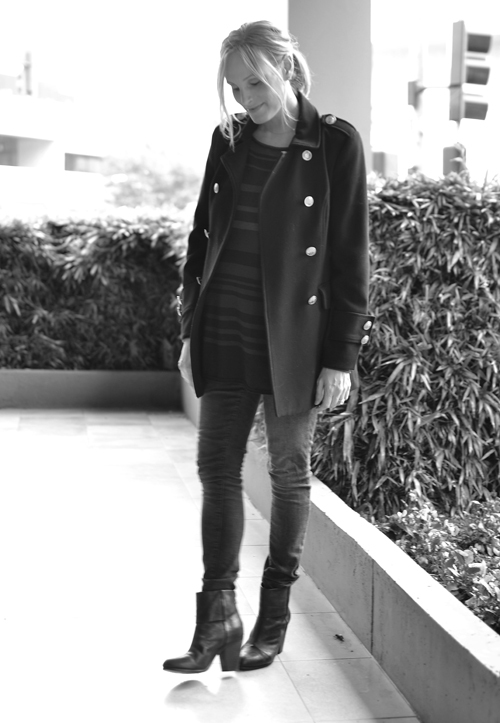 The peacoat is the perfect touch -- and the those jeans rock too! Very edgy! I've had my eye on those Rag and Bone booties for so long. I havent caved yet, but I sure did hear that they were comfy. Still looking gorgeous with your cute lil belly! Are you still wearing your regular pants?! I envy you - I could never be so lucky. Ever rocking that baby bump with that fab outfit!!! Looking fab per usual. Crazy weather last weekend, but those booties must have been perfect! 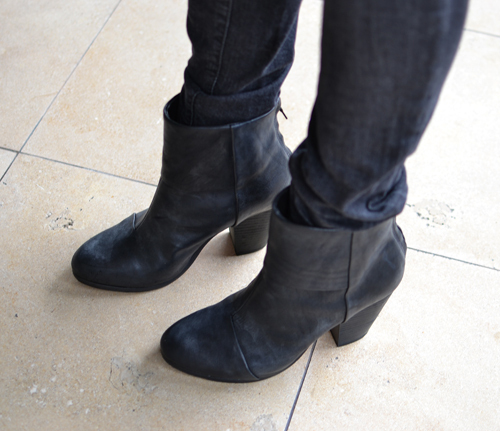 I've heard so many great things about those Rag&Bone booties... they are such closet staples and look great on you! Beautiful little booties! I'm convinced Rag & Bone makes the best booties out on the market right now. Those shoes look like the perfect bootie! Great outfit! I love the booties, they look great on you. Wow, such great style! The Newbury boots are so versatile! I have been lusting after the floral ones! Looking beautiful as always friend! ps - Where is your bump? I swear I can't even hide mine anymore and you look like a skinny-minny! This outfit is very fitting to your blog name. Casual glamorous - casual chic! Wow, great booties and just love the military inspired navy coat! Glad to have found your blog. I hope you are enjoying this holiday season! If you get a chance, I would love for you to stop by and check out my post on some Christmas style and one of my favorite LBDs! Have a great day!